The Igloo Marine Ultra Cooler Series is one of the larger and more popular lineups that Igloo offers. As the name suggests, these products are designed to be right at home on a boat out on the lake, river, or ocean. This is accomplished by including certain features that are necessary for the unique conditions that marine environments tend to have. There are both soft-sided and hard-sided marine coolers. We will break down each below as well as any pros and cons that they may have. But first, we list some of our favorite Igloo Marine Ultra models for your convenience. 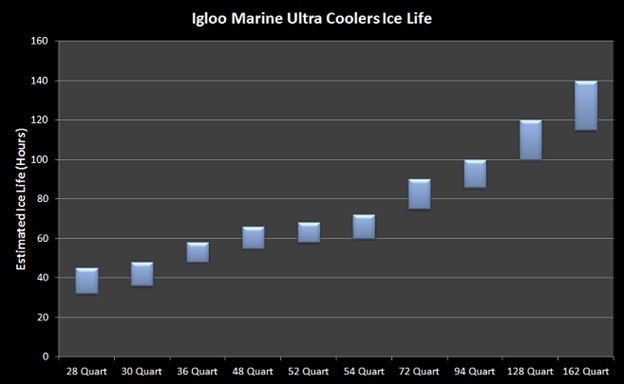 The Igloo Marine Ultra Cooler Series has gone through quite a few changes over the year. Most notably, the number of sizes has been reduced significantly. What was once known as being one of the larger collections of coolers of any series in the industry, Igloo has trimmed it down to a more manageable number. Currently, you can choose from 30-quart, 36-quart, 48-quart, 54-quart, 72-quart, and 94-quart non-wheeled version. In addition, Igloo also has 28-quart and 52-quart wheeled models that they have dubbed the “Quantum” Series. Despite the trimming that was performed, there are still plenty of sizes to choose from that span from the small range all the way up to quite large. The only sizes noticeable missing are huge coolers (ie 100+ quarts). This normally wouldn’t be an issue, but marine coolers oftentimes need to be on the larger side since the required storage volume tends to be higher. That being said, it is still quite easy to find some of the older and larger coolers on many online marketplaces such as Amazon. In fact, you should have no problem finding sizes up to the massive 162-quart options. We just wanted to note that, as of the writing of this article, Igloo apparently no longer carries these other sizes from their site. If this changes in the future we will update this article accordingly. The Igloo Marine Ultra Cooler Series is designed to handle Mother Nature’s worst while out on the water. This comes in the form of various features that will help these coolers survive the harsh wind, sun, and water that is common in aquatic environments. One of the most essential pieces to this is the UV-protected outer shells that are included on all Marine Ultra Coolers. This shield is a special coating that protects the cooler from fading and sun damage that can be common on coolers that are exposed to direct sunlight for long periods of time. Another benefit of this outer protective shell is that it is very resilient to mold and mildew buildup. Being constantly exposed to water can create a safe haven for bacteria and mold to grow. Finally, it is extremely easy to clean with a water hose and can handle soaps and other cleaning products without issue. The “cost” of this shell is that all Igloo Marine Ultra Coolers come in one color: white. This is a necessity as any colored options would be more likely to fade. Another feature that we really like is the carrying handles. On the smaller sizes such as the 28-quart and 30-quart, you will find overhead comfort grip handles. And on the larger sizes, these are replaced with side comfort grip handles. These handles, as the name suggests, provide a good, comfortable grip which is essential in water environments. Things can get very slick and making sure that you don’t drop a heavy cooler full of items is vital. Another important feature that the Igloo Marine Ultra Coolers have is stainless steel hardware. Lesser metals are prone to rust when wet and using stainless steel, while more expensive, is a no-brainer for anybody wanting a long-lasting cooler in these conditions. While these core features can be seen on every Igloo Marine Ultra Cooler, there are many additional features that are specific to a particular size. For instance, many of the larger sizes (48-quart, 52-quart, 72-quart, and up) will come with a built-in fish ruler on the lid of the cooler. Seeing how marine-inspired coolers will oftentimes be used for fishing excursions, this is a great feature to add. Certain sizes will also come with features that assist with improving ice life. For instance, some of the mid-ranged sized will come with Cooler Riser Technology. This is a special design that elevates the base of the cooler off of the ground. This reduces how much of the cooler is in direct contact with the warm ground, improving ice life. In addition to elevating the base, all Igloo Marine Ultra Coolers are equipped with the proven Ultratherm Insulation. While not as thick as we have seen on some of the other Igloo coolers, Igloo states that this lineup can experience up to 7 days of ice life (we test this below). Finally, it is worth mentioning the wheeled options. These models will obviously be much more mobile and come with waterproof rubber tires. To transport them, there is an extendable handle that can be tucked in when not in use to minimize how much space it takes up. The Igloo Marine Ultra Coolers are pretty plain in appearance. As we discussed above, the white external color is sort of mandatory as any other color is prone to fading under the sun. There are some subtle curves to add a bit of variety but these are, more or less, extremely simple. That being said, there isn’t anything wrong with simplicity. You can tell the quality when you see the sturdy handles and stainless steel hardware. Overall, it is a good, safe look. Ice life is very important, particularly on a marine cooler. Having your ice melt prematurely while out on the water could spell disaster. You could ruin your food, your catch, or have to deal with warm beer! To help combat this issue, Igloo has designed their Marine Coolers with various components to help prolong ice life. We discussed many of these components already but the most notable ones include the quality hardware that ensures a good, tight fit and the Ultratherm insulation. Igloo has come out and stated that their Marine Ultra Coolers are capable of up to 7 days of ice life. And on the newer, smaller models, they say that you can plan on up to 5 days. As is typical, the largest coolers offer up the longest ice life. In optimal conditions, you can expect around 140 hours of total ice life in Igloo’s largest Marine Ultra cooler. This isn’t too far off from what Igloo has said. As for coolers currently on Igloo’s website, the largest option is the 72-quart. It is noticeably less than the gigantic 162 quart but still offers up a respectable 90ish hours of ice performance. Overall, we are pretty happy with these results. The insulation used is a bit thinner than on most of the premium coolers and these ice chests also don’t utilize the super thick rubber gasket that many higher-end coolers have. This does result in a slight hit to performance. But for most people’s the ice retention rate is still plenty long for their needs. Similar to the Igloo Marine Ultra Coolers, the Igloo Marine Ultra Softer Coolers have also gone through some changes over the years. However, unlike the coolers, the soft coolers have actually increased in product selection. Currently, you can choose from 24-can, 28-can, 32-can, 36-can, 40-can, and 46-can options. The exact amount of storage space in quarts can vary, but these sizes will offer roughly 12 to 30 quarts of storage. It is also worth noting that the configurations of the various models are quite diverse. You can choose from dual zone cooler bags, snap down cooler bags, tackle box cooler bags, backpack cooler bags, switch convertible backpack cooler bags, tactical duffel cooler bags, and more. Each of these will come with their own unique pros and cons and will be optimal for specific conditions. The Igloo Marine Ultra Soft Cooler lineup may vary quite a bit in terms of layout but they all share a common bond of having essential features necessary for being out on the water. In addition, they are designed with features that make them quite mobile and user-friendly. For handling harsh marine conditions, you will find that these products come with an antimicrobial liner. This liner is not only leak-resistant but will also help fight off the onset of bacteria or mold growing on it. In addition to this, all of these products are equipped with non-corrosive hardware. While not as strong as the stainless steel found on the hard-sided coolers, the material used here is still plenty resilient and should last for many years. Depending on which model you go with, there are several carrying methods to choose from. In fact, several models come with more than one. For instance, the Marina Ultra Coast Bag has both an adjustable padded shoulder strap as well as an easy-grip overhead handle. This helps to ensure that you have a good, slip-free grip no matter what position you are in. Another cool feature is the removable hard plastic liner available on certain models. For example, the HLC 24-can cooler bag comes with this easy-to-clean hard plastic shell. This shell not only helps with rigidity but also provides an easy way to clean the cooler bag after a fishing trip. As you can clearly see, each cooler bag will have its own unique perks. But one thing that they all share (in addition to their ability to be out on the water) is there helpful additional storage options. Every model will come with at least one external pocket. And in cases like the Marine Ultra Tacklebox, it will come with several including ones on the side. As for added toughness and to give a boost to ice life, you will find Igloo MaxCold insulation. And with the recent model updates, Igloo has increased the foam thickness by 25%. This is sure to give a boost to performance. For a looks standpoint, the Igloo Marine Ultra Soft Coolers are quite attractive. They all come in a two or three-tone color schemes. You can pick between a lovely light gray/dark gray/neon green look or the more traditional blue/white look. And there are also plenty of the old style black/white models floating around. Seeing how you tend to “wear” soft coolers, it appears that Igloo did put a bit more effort into making them look more stylish than their hard-sided marine coolers. Not only are the colors nice, but all of the pockets and various features fit in well with the overall design and accomplish a streamlined look. The primary goal of Igloo’s Soft Cooler line is to be a short-term cooling solution. The combination of being much smaller than a typical cooler and also not having the thick, hard-sided insulation does mean that you are unlikely to see quite the ice life. However, Igloo has implemented thicker MaxCold insulation layers, used quality materials, and followed tight manufacturing tolerances to make sure that their marine soft coolers will have the best performance that they can have. Again, the larger models tend to hold ice longer. Interestingly, there was quite a bit of overlap in potential ice life from one model to the next. For instance, the 32 can soft cooler could potentially have almost as much ice life as the 46 can (under optimal conditions). The maximum ice life we could achieve was around 35 hours. This obviously isn’t nearly as long as most hard-sided coolers, but it is still more than adequate for a day on the lake or at the pool. In fact, it will be among the highest ice life that you will find in soft-sided coolers at this price range. The price point for the Marine Ultra Cooler products can vary quite a bit depending on which model and size you are looking at. But considering the quality and performance you will enjoy, they seem to be at a pretty good price point. There does seem to be a bit of a surcharge for the larger coolers. We aren’t sure why this is (perhaps it is due to limited supply?). Because of this, we encourage you to shop around to find the best deals. Yeti has always been one of the first brands that come to mind when you think of a quality cooler. But how do they compare to Igloo Marine Ultra Coolers? Obviously, the Igloo series is designed specifically for aquatic environments. It comes with a specialized outer protective layer that will help combat harmful sun rays. Other features such as rust-proof hardware and anti-bacteria inhibitors are further evidence of its intent. However, Yeti is “all-around” tough. While they might not necessarily be designed specifically for marine environments, the fact that they still use great materials and extra tough components means that they can easily handle just about anything Mother Nature can throw at them. Both brands have a large selection of sizes and shapes. And both brands have a variety of accessories to help make the most of their product. But in terms of raw performance, Yeti has a clear edge. Ice will typically stay frozen longer and it will be able to handle more environments than just marine. But Yeti Coolers are also much more expensive. So which is better? Well, it depends. If you are looking for a cooler specifically for use on a boat or on a canoe, go with the Igloo Marine Ultra Cooler. It is designed for that and will have features that make it more convenient to use. You will also pay less. 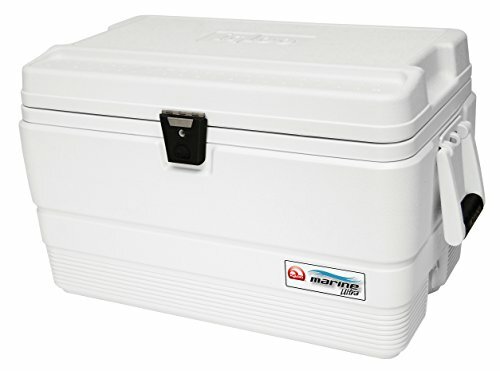 But if you are looking for an “all-in-one” cooler that you can not only take on the water but also use for tailgating, camping, and cookouts, then go with the Yeti. Sure, you will pay a bit more but you will also enjoy longer ice life. But no matter which option you go with, you should be quite happy with your purchase! This is our Igloo Marine Ultra Cooler Review. Igloo Marine Ultra Coolers are Igloo’s standard and proven offering for Marine enthusiasts for many decades, and as such are loaded with unique features exclusive for marine functionality. 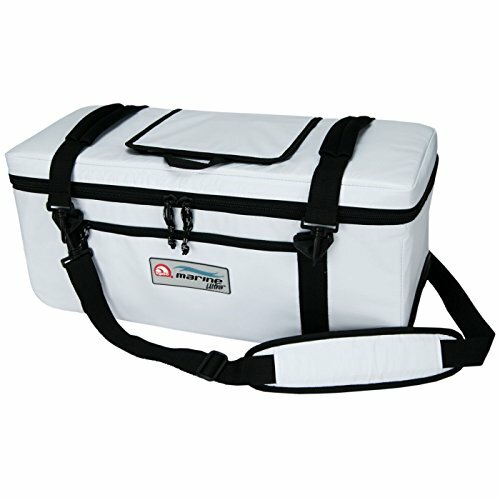 These ice chests contain Ultratherm insulation, UV inhibitors to guard against sun damage, marine-grade and rust-proof hinges, stainless steel lid strap, non-slip grip handles, stain and odor-resistant liners, stainless steel hardware, threaded drains in the larger sizes, soft-side rally wheels (where applicable) and many other features. It is available in 25, 36, 48, 54, 72, 94, 128, and 162 non-wheeled and 28 (Quantum), 50, 52 (Quantum), 60 (Ice Cube), and 110 (Glide) quart wheeled options. They are made of plastic and contain metal hardware. The insulation ability varies quite a bit on these coolers, depending on size. The larger, 100+ quart options promise to keep items cool for up to a week. This is accomplished by the relatively thick Ultratherm insulation as well as a decent lid seal. In our tests, the largest sizes actually can approach near a week of ice life. As you move down to smaller sizes, the ice life goes down accordingly. In the smaller models, expect more like 2 to 3 days of ice life. This is still pretty good and should meet the requirements of most people. Many of the Igloo Marine Ultra Coolers come with comfortable easy-grip handles. This is quite helpful as the larger sizes can be quite bulky. And when dealing with a marine environment, having a good grip is also helpful because things can get slick. In addition, there are a couple of different wheeled configurations for those who would prefer to just pull their cooler rather than carry it. As for features, there are quite a few helpful ones that make these coolers right at home on the water. These include things such as an embedded fish ruler, built-in bottle openers, UV-inhibitor surface, and more. The design is simple yet looks high-quality. The metal hardware and off-white handles give a nice contrast to the all-white look. The wheeled options are able to incorporate rather large wheels without making it look too extreme or cheesy. This all combines for a classic look that seems right at home on a boat. But for those wanting colored options, you will be out of luck. Because of the huge range of sizes and features available on these coolers, prices will vary quite a bit. As such, we recommend that you figure out what sort of size you are looking for and then shop around. Prices can be had for as low as the budget range and can go all the way up to the premium-tier in some cases. The Igloo Marine Ultra Cooler Review earns a 4 out of 5 cooler rating. A proven, established marine cooler that has all of the features you need for our next boat trip. The huge range of sizes means there is likely something for you, and you get quite good ice life in the larger options. Overall a great range of coolers but shop around for good prices. But for those that are looking for a more “all-around” cooler, there are models out there that will offer slightly better performance. And you won’t be limited to just white, either!